So, this post has been a ridiculously long time coming. As in, 2 years and 3 months long. Prepare yourself for an absolute onslaught of photos, because friends ... MY LIVING ROOM IS FINISHED! This feels epic just to write, so even if no one cares, I will treasure this post, lol. This pic is ridiculously small, sorry, but this is how it looked when we toured for the first time. The house was built in 1969, but was sold (and redecorated) in 1990 before we purchased it. Oh, that nasty mauve and cream. Everything in the house was country colors: mauve, cream, country blue, butter yellow *shutter*. Oh, the awful memories. The living room and dining room are the biggest undertaking as far as painting walls - look how tall that ceiling is! We loved the beams and the size of the room, and just how different the house is, you know? I could see the potential. 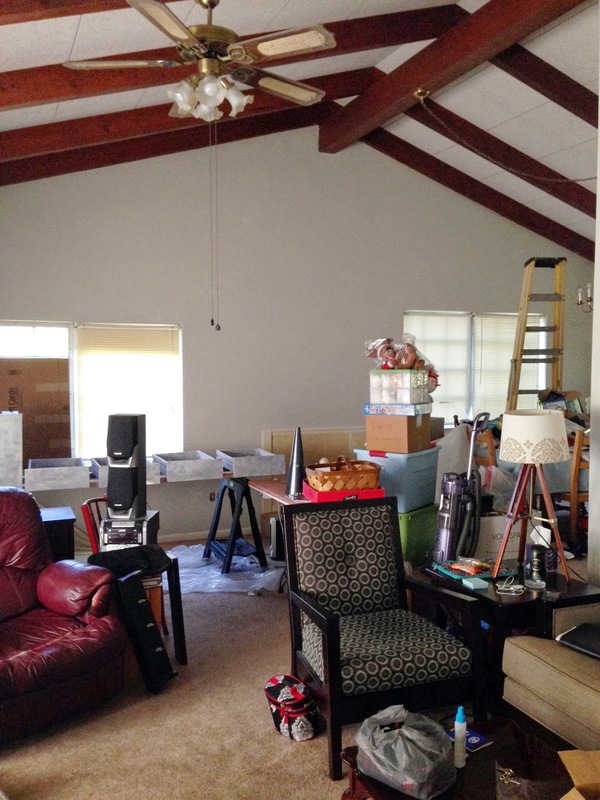 We had great plans to paint and fix and decorate, and we did a bit, but then we had to move more suddenly than originally planned, filling our house with boxes of junk we didn't get to sort through, and making other more necessary fixes come first. Quickly, it all became overwhelming trying to live here, work, and fix the house all at once while still keeping our sanity. 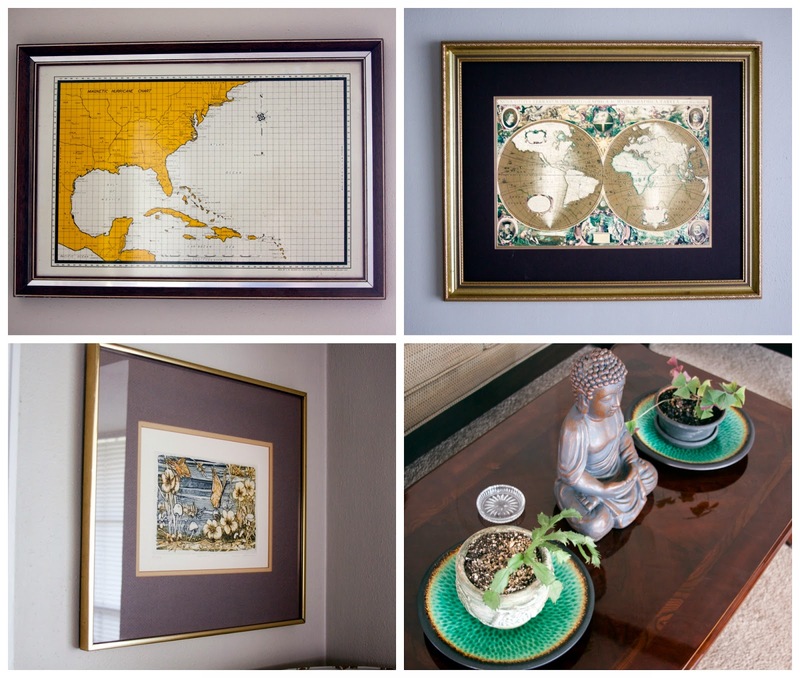 I would have small bursts of home improvement moods, but they were few and far between. We just eventually let everything sit like it was and just tried not to think about how awful it looked. 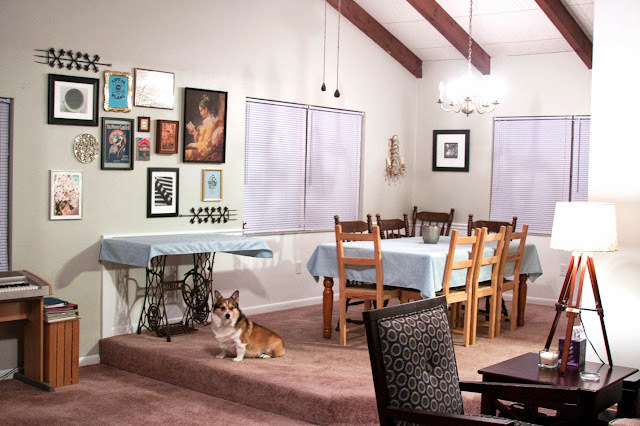 Before this past January rolled around, I had manage to paint almost all of the living room, except the far wall and dining room - it was too tall for me, so the wall was the last remnant of the awful pukey mauve. 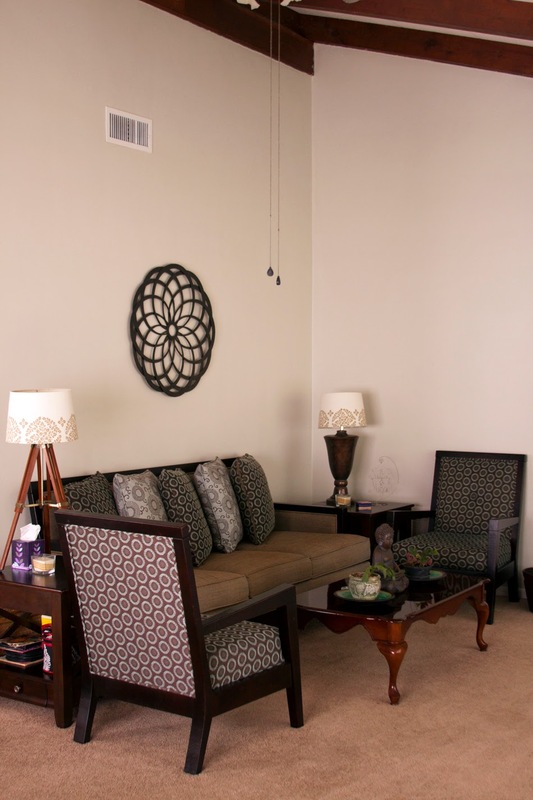 This is the view as you walk in the front door and turn to the living room. Notice anything different, lol? The paint was purchased long ago from Sherwin Williams on sale. It's their Super Paint Latex paint in Sedate Gray (possibly the most depressing color name ever, ha ha) with a satin finish, and the trim is their Pro Classic Latex Acrylic paint in untinted white. This was the largest single expense of the room, and I'm guessing I spent $200 on the paint, but that was back when I still had a little money so it worked out. This area was the first to be finished, but I've made some little additions over time. We used to have our tv in here, but back in October of last year we decided to move the tv into the cleaned out den since it's cosier in there. So, details. The metal thing on the wall came from the clearance section at Target about 1.5 years ago for $24.00. 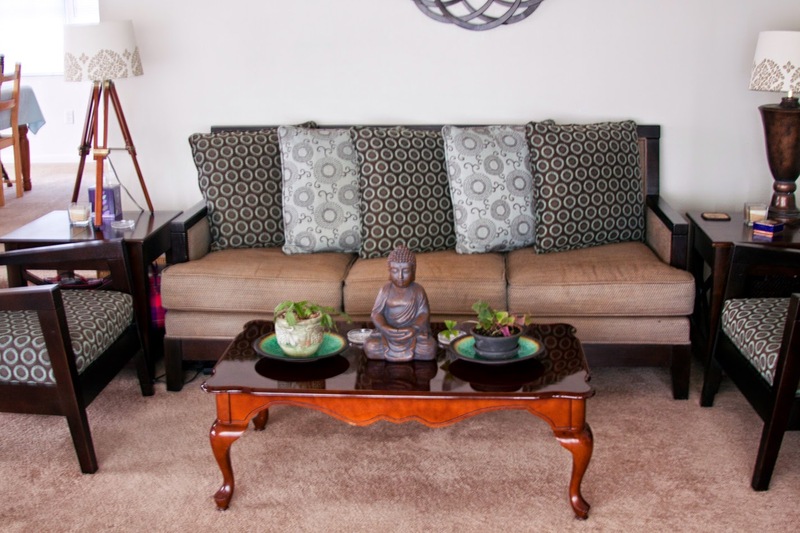 The couch and chairs were the best Craigslist score I've ever had - yes, I kid you not, they are from Craigslist. Amazing, right? A man down in Vero Beach had purchased a model house that came fully furnished, so they sold off some of the model furniture. I happened to see the listing 10 minutes after he posted the couch, and I was the first to contact him out of what would be over 50 people. My dad and I drove down that night with his truck and got this baby for $100 (I know, right?!). Since we had come so far, he said he was eventually planning to list the chairs as well, so he went ahead and let us get them as well for another $100. These chairs were almost brand new - only sat on when people toured the model house. It's still crazy when I think about it, lol, but I've had them since shortly after we purchased the house. The side tables were ours from our condo, and the coffee table was a yard sale score at $15 - it has a small scratch on the top, but other than that it is perfect. 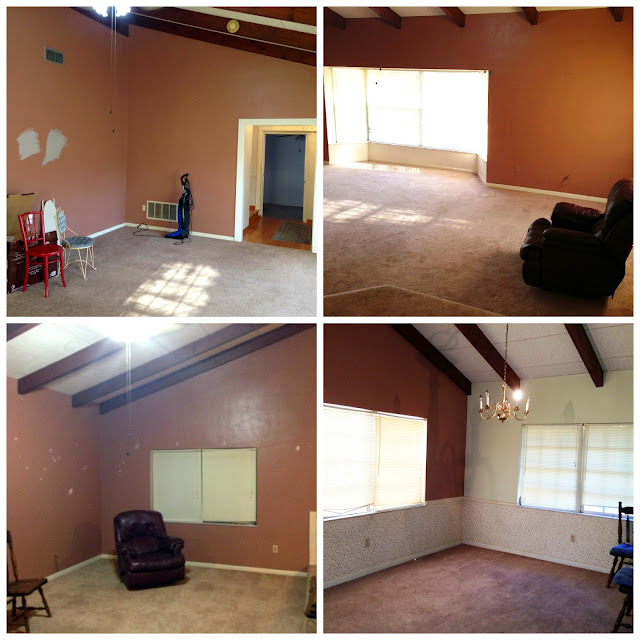 The other half of the living room is pretty sparse looking at the moment. I have a coffee table that I purchased a long time ago that will become a bench for that space under the window - I'm just trying to find fabric that looks good with the other couches. The table in the window was Justin's grandparent's. 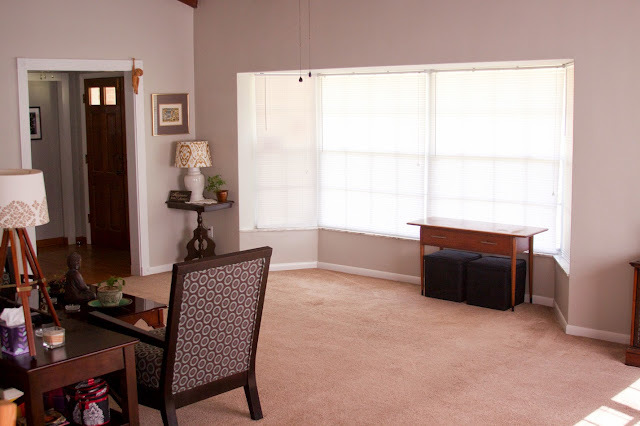 I even painted the metal frames of the windows white back when I painted the bay window area and it's still holding up wonderfully :) Back when I painted this window area, I replaced the funky dirty cream colored blinds. Oddly enough the smaller windows were the most expensive because they were a custom cut size. All the blinds in this bay window cost $100.00, but it was worth every penny as it is so much brighter in here now! 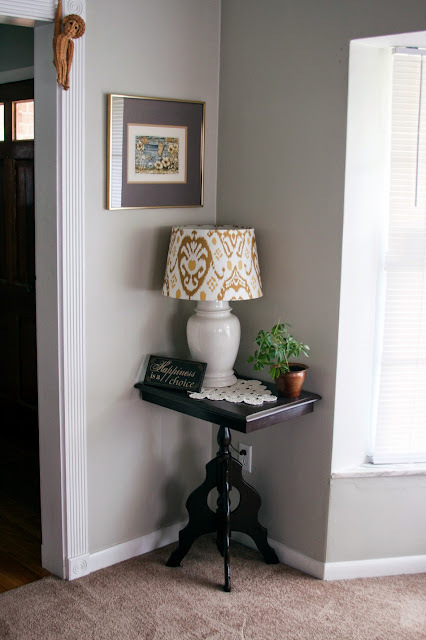 Here's the little corner I previewed a few months ago when I painted this table. The table was free from a friend when she moved and I painted it Espresso brown. The lamp was thrifted for $3, the shade was a clearance grab from Target for $6, the doily was thrifted for $0.25, and the plant came from Liz when she moved. 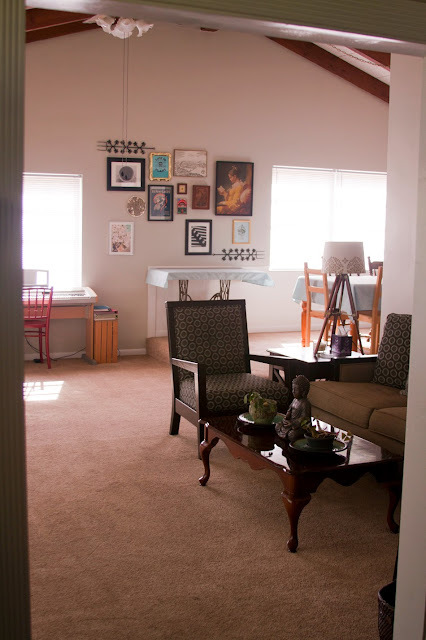 The painting is one of my favorites I found at a thrift store for $5 (more info on that below), and I put that creepy wicker monkey in the archway as a joke and he has now become a fixture - he was free. Ugh, it's a terrible quality before photo, but this is the bay window before and after. Pretty crazy, right? I love this area now. 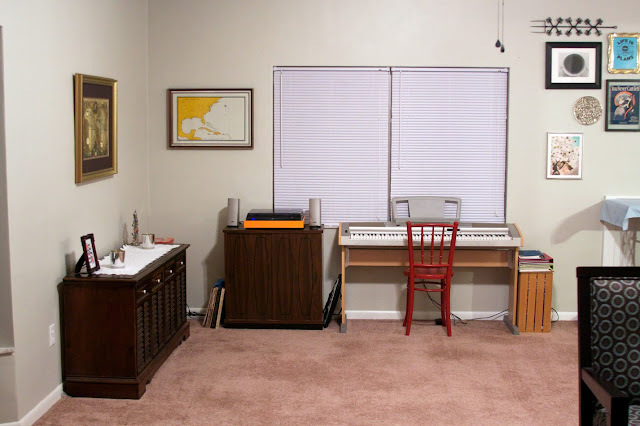 As you rotate around the room, the music area is next. This area will change a little over time. 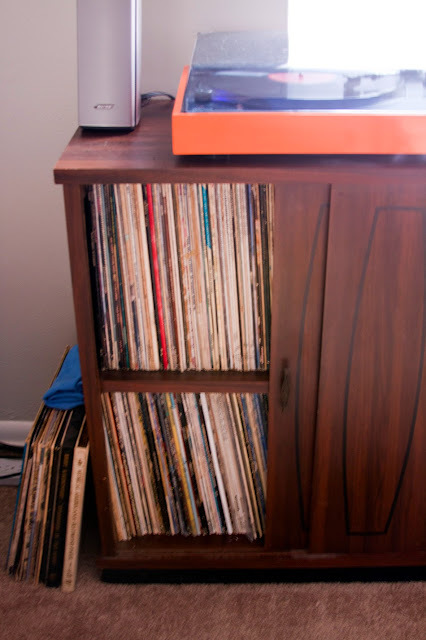 The old hi-fi cabinet was inherited by my husband, along with the cabinet holding the records (the record player is on top) and about 1/3 of the records inside. Next to the hi-fi is a stack of the larger record collections from the 60s (The Longines Symphony Orchestra plays Nat King Cole, etc.) - these won't fit in the cabinet now, so I have them here until I figure something else out. On top of them is a neat Italian cookie tin that I use to hold things like record cleaner and other accessories. Eventually, I will do a little carpentry and cut out a bigger area for the record player, and set mine inside to kind of re-do the cabinet. The other side has the record player and speakers (some day to live inside the other cabinet), along with my keyboard and piano music. The red chair will be painted another color sometime - I just haven't decided what color yet. The red chair was a thrift store score for $6.00, and it has a really neat pattern on the seat. The next area around the room is the dining area. Gordo even posed for this shot - how lucky are you? :) Look a little different? The dining room has my awesome solid wood table in the center, which was given to me by a friend when we bought the house. It needs to be redone, but until then it just always has a table cloth on it. 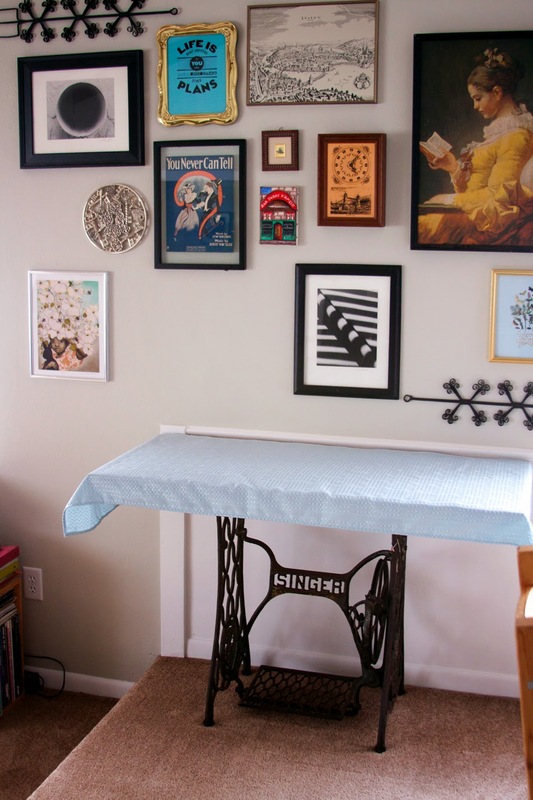 The table cloth was a sale purchase forever ago for $9, and it was actually too long. This was one of my finishing touches two weeks ago - I finally cut down the table cloth to fit the table and the leftover piece was just large enough to cover the top of the sewing machine table (the actual top is horribly rusted because its former owner kept it around their pool deck - weird, right?). The chairs are a mix of two sets - 4 are Ikea Ivar chairs that we used with our Ikea table in our old condo (that table is now in my sewing room), and the other 4 were a set that I bought at a thrift store for $15.00 just so we would have chairs. I can technically fit all 8 at the table, but it's a bit crammed, so that extra just chills in the corner unless we need it. I also replaced the blinds on all these side windows - I was worried it would be too expensive at first, but seriously lucked out. All 3 of these large windows are actually 6 smaller windows of a standard bedroom size. So I was able to buy 6 regular sized mini blinds for $3.99 each! How cool is that?! This is such a vast improvement from the horribly dirty cream colored ones. The light coming in the room is so worth the $24 these cost, no question. 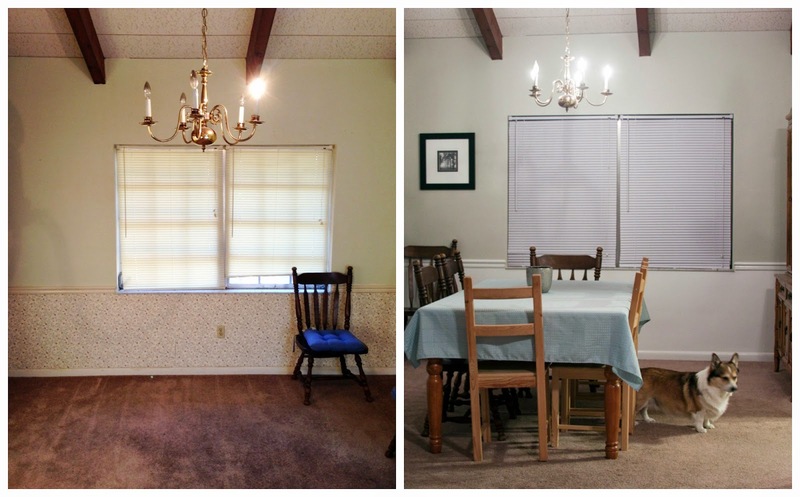 Again, sorry for the bad before picture here, but this is a before and after of the dining room. 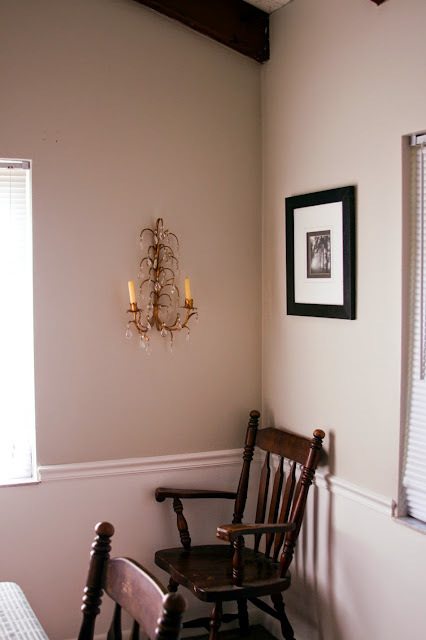 The walls were cream colored with cream trim and 2 layers of wallpaper under the chair rail. 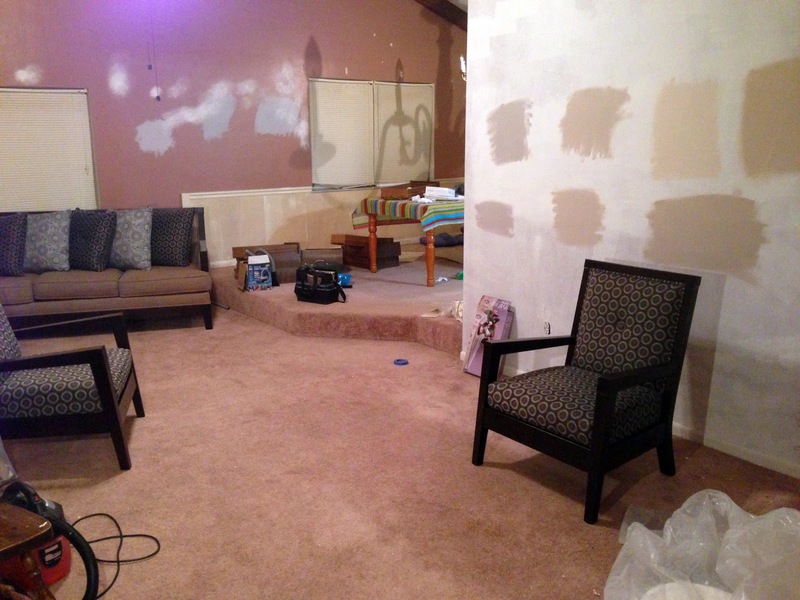 Getting all that wallpaper off was not a fun experience, and it took me a long time to decide what I wanted on the bottom. 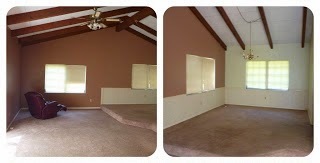 Should it be all the same color with contrasting trim? Should it be an accent color under there? I just didn't like any of the options mentioned, until Shannon suggested painting it all white and eventually making fake wainscoting. Since it was the only appealing sounding idea to me, we went for it and I really do love how it turned out. 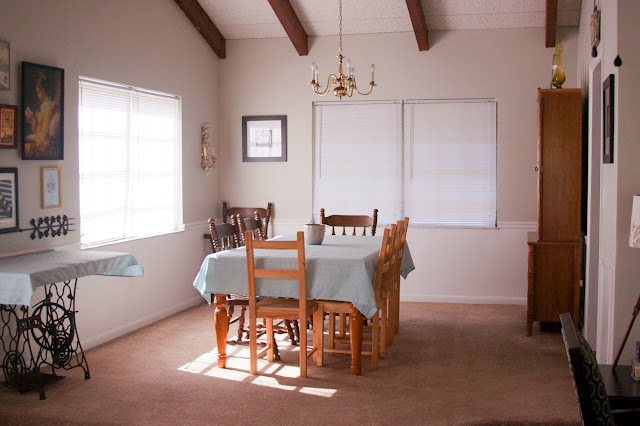 The entire area under the chair rail is painted with the same semi gloss pure white paint as all the trim, and I plan to eventually add wooden frames of the same size all the way around and paint them white to match so it looks like real wainscoting. Also, we do have a new light fixture to hang above the dining room table, but I have to wait until I can afford a professional electrician to install it for us. One of these days. That extra chair just lives here, but it comes in handy occasionally elsewhere in the house. That gold colored chandelier belonged to my Great Grandmother, and it is at least as old as the early 1950s (I know this because my Grandmother says her mother-in-law had it before she married my Grandfather and she just remembers how much she hated cleaning it when they lived with his parents, lol). The square framed print was picked up at Marshall's (with another to match on the other side of the room) way back when we were in our condo. I plan on cutting the frames open and putting some of my shots in them from when I shot square format film during my experimental photography years. 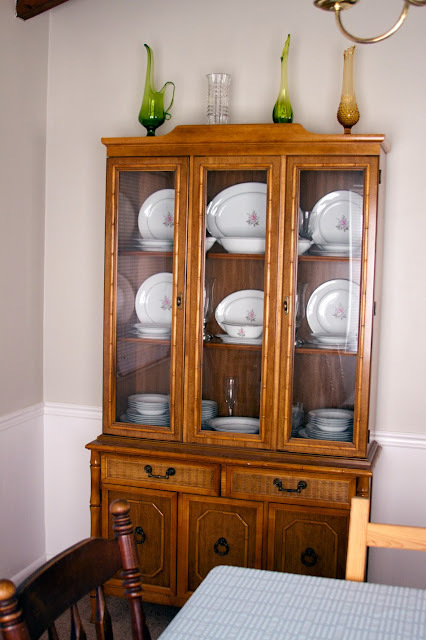 This china hutch as well as the lovely Noritake china inside came from my Grammy - they brought it all back from when they lived in Okinawa. I have her fancy silverware in a case in there too :) The china pattern is a pretty pink rose with silver rims on the dishes. I have a crazy huge service, including 14 tea cups, lol. Now that it's finally in its place and accessible, I can actually use it for company :) The vases at the top all came from Justin's Grandma. 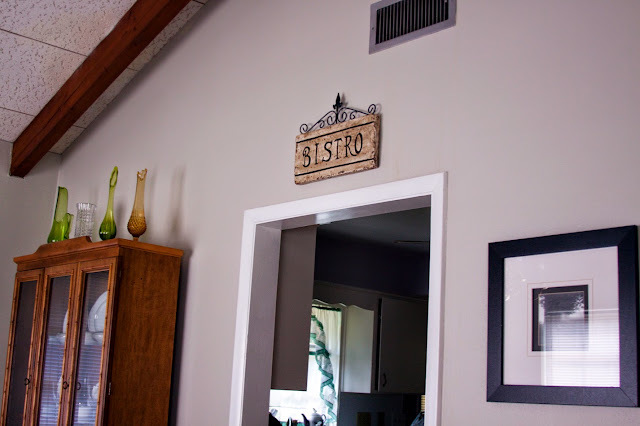 This cute Bistro sign was in our condo too, and I thought it was fitting to have it over the kitchen archway. And that picture is the one that matches the other frame so its print will change soon. Also, I still need to spray paint that ac vent white. I love my gallery wall in the center of this room, but it is still a work in progress. I'm searching through my final junk room to find a few more things before I make everything a done deal up there. 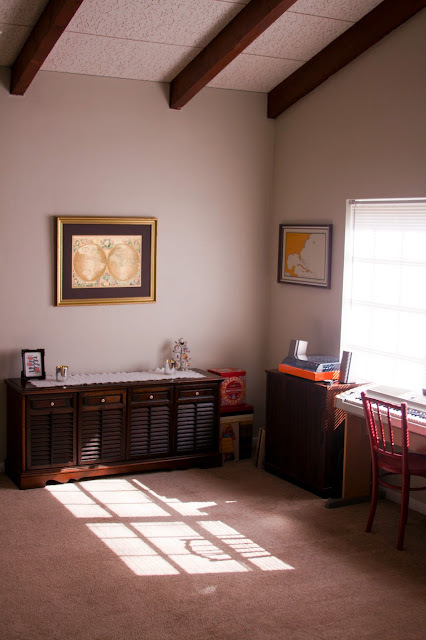 Everything up there is a mixture of thrift store finds, things I picked up on vacations, some of my husband's photography prints, or things I've won :) I also absolutely LOVE the sewing machine table. This was an estate sale deal that I snagged for $20 because it was still left at the end of the sale. Like I said earlier, it was kept around a pool deck before so it is pretty rusty. The bottom still looks good - it's just the awful top that has weathered boards and a metal top that is all rusted. I plan to replace the top later on, but until then the table cloth works well. And just for posterity's sake, this is what the room looked like in January when Shannon had just finished the large wall and we were working on the kitchen cabinets. Yes, I lived with my room like this for weeks, lol. 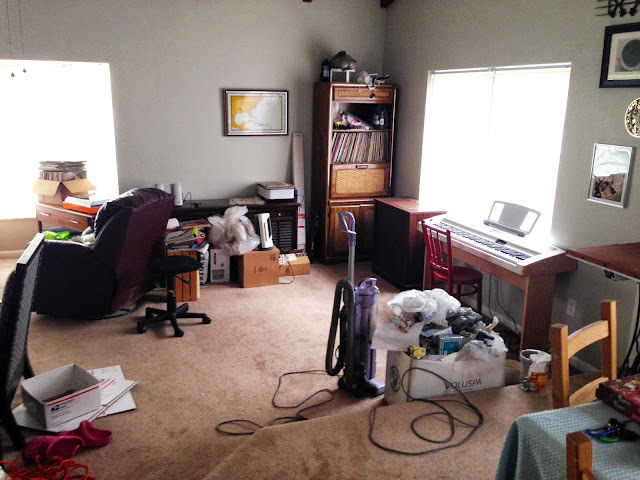 And even just a month ago, the room looked like this. This was just after I finally finished painting the cabinets so I got to clear this area of painting supplies. Just this change was a major celebration, but I still had to figure out the record player placement and whatnot. I didn't clear out all this clutter and excess furniture until just two weeks ago. Now that it's all finished and I love the room so much, I can't believe that I ever lived like this complacently. I'm addicted to clean spaces now at least. And, because I could, I had to post a panoramic view of the whole room :) Isn't it awesome?! Holy crap, that's much more expensive than I thought, lol, but the fact that the price is including a new couch set, that's pretty freaking good, right? We paid more than that just for our other couches that are in the den, you know? So considering that this price is a completely custom, finished room that's really cheap. Plus this expense was spread out over the past 2 years, so it never felt like that large of an expense. 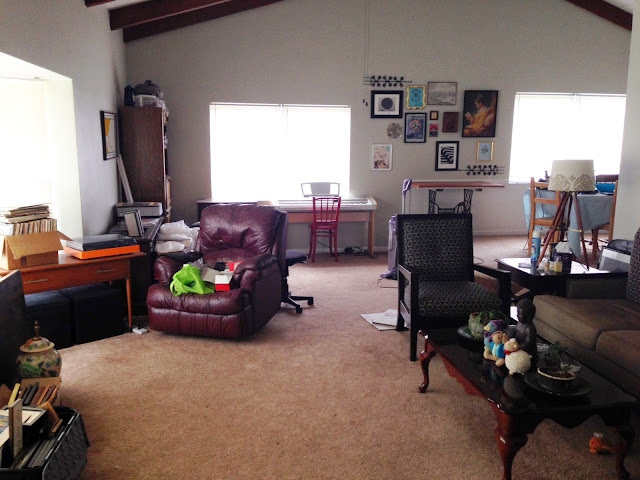 By the time I get other planned projects finished up, this room will still be about $1000 - and this is technically two finished rooms :) I'm totally happy with that price. I feel your pain! My house has several "big money" items that need fixing too (like plumbing), and it really killed my mojo to get simpler projects like this room finished. Happily it doesn't have to take 2 years like to do this, lol. It's not so bad to do things little by little though - I definitely appreciated the little changes over the years even though the room wasn't finished. Also, if I had any idea it would cost $800 I would have probably never started this project, so I guess it's good that I did it over the course of 2 years, you know?